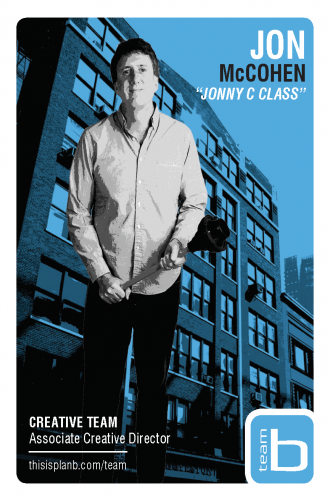 Jon’s past lives include stints at Leo Burnett, Havas Worldwide, Digitas, and Razorfish. He’s never been afraid to venture outside of his comfort zone, embracing the challenge of a cosmetics account or a presentation in singsong (Jon’s a terrible singer). He’s worked on everything from Citibank and Sprint to Budweiser, Coca-Cola, and Wrangler. Jon’s wide range of brand experience and ability to solve complex problems make him an important asset to Plan B. And his knack for deep-frying turkeys comes in handy more often than you’d imagine. Jon loves to write, learn about new brands, and push the limits of business casual attire. Jon grew up in the Washington, D.C. area and attended James Madison University, where he studied marketing and English. He enjoys golfing, biking, live music, developing a world-class bourbon palate, and keeping his two toddlers from destroying the house.